"How very losable your identity was, Caroline thought, lulled and drowsy. Stripped of your social security card, your charge plates, that old, old reminder from your dentist, you became nobody, or anyone at all." Caroline Emmett has been sent to a rest home in Wicklow, Massachusetts upon orders from her doctor. There she will recuperate from pneumonia and mental duress following her discovery of her husband's dallying with a woman half his age. Walking in the countryside she finds to be more therapeutic than any treatment from her nurses and doctors at the rest home. One evening she takes a detour from her regular path and climbs up a hill. She witnesses the brutal beating of a woman at the hands of a bulky figure wearing a man's raincoat. Or so she thinks. He shines his flashlight on her leaving it there for several minutes and Caroline flees. Bad weather -- rain and wind -- force her to seek shelter before she can return to her room. She manages to gain entry to the home of the Olivers where she tells her story while they listen with a mixture of disbelief and curiosity. She'll remain here for the next twelve hours while the killer in the raincoat tracks her down. This is familiar territory to be sure -- the eyewitness to a crime who seems to have imagined everything. Of course no body is found where Caroline said she saw the attack. But don't expect the story to fall into the trap of a well-worn formula and an obvious unfolding of events. Enter Carmichael, the editor and owner of the local newspaper, with a nose for news and a healthy dose of common sense. He is the only one who believes Caroline. With the permission of a lackadaisical and skeptical policeman named Trunz the newsman heads out to the crime site to do some real work. He quickly finds two sets of footprints in the mud and a woman's patent leather shoe. Size 9. Something bad has happened he is sure. And he begins his dogged search for the woman with one shoe. Or her dead body. 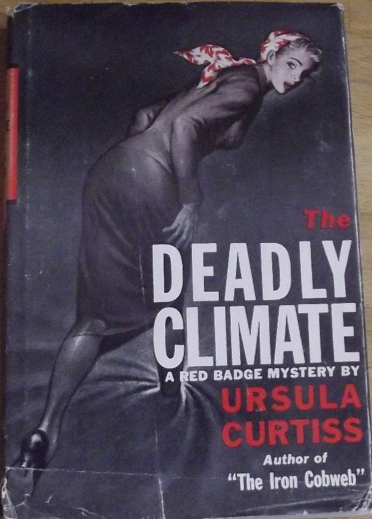 Ursula Curtiss was the daughter of Golden Age mystery writer and police procedural pioneer Helen Reilly. She came to writing fiction late in her life unlike her prolific mother, but seemed to have inherited her mother's talent for tight plotting, lively and original characters, and well rendered settings. She surpassed her mother with an enviable talent not too easily mastered in crime fiction. Curtiss' mastery in nearly all her books is her skill in creating mounting dread and terror. In The Deadly Climate (1954) she creates a household of suspicion and paranoia. Caroline seems to have found a haven from the mysterious attacker but no one, not even the practical minded and forthright teenage daughter Lydia Oliver, is really on her side. Over the course of a single night the killer stalks Caroline, makes two attempts on her life, disables the only car available to the Olivers and turns their would-be refuge into one of peril. "It was infinitely worse...with the shades drawn," Curtiss writes of Caroline's racing thoughts. "Like breaking uncontrollably into a run, or giving way to tears, this hiding from the night let down the frail barrier of pretense." Dread builds to the point where even a rambler rose scratching up against a makeshift cardboard window pane gives rise to fearful glances from the characters and a chill or two from the reader. The world Curtiss creates is also one of arbitrary happenings, oddities and the just plain weird. While Caroline is attempting to gain allies in the Oliver family two strangers interrupt the night's already chaotic events. A young man appears selling storm windows and a middle-aged woman comes collecting donations for the Red Cross. Coincidence or devilish design? Everyone who makes an entrance in the story is questionable in their apparent innocent motives. Who sells storm windows during a storm? Only the most opportunistic of salesman, right? Is he even a salesman? Why does a woman go ringing doorbells in the rain asking for charitable donations? And why does Lydia insist that the woman is not Mrs. Vermilya as she claims she is? Carmichael's investigation of the victim is the highlight of the story. 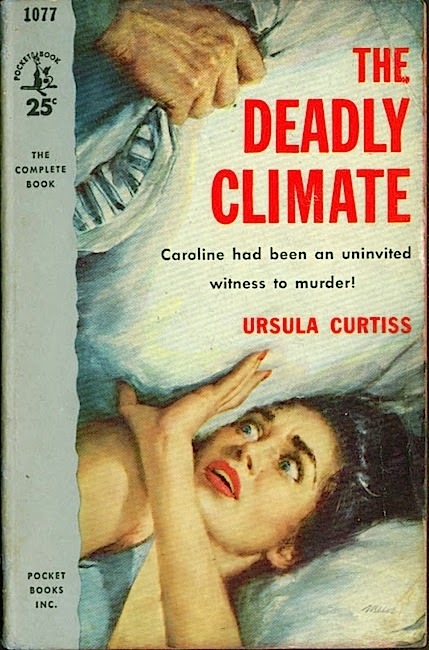 Here Curtiss shows she knows how to spin a good detective novel. We watch him turn to the newspaper clippings in the morgue and ask for help from his reporter colleagues as far away as Pennsylvania. He begins to put together a jigsaw puzzle of the past that sheds light on a crime involving an illegal abortion operation and a suspicious suicide. Not that it's all fun and games for Carmichael. One of the more interesting moments is the unease and discomfort he experiences while rummaging through the victim's belongings in her hotel room. His discovery that she mended all her clothes including a wispy and intimately sheer nightgown allows him a moment of sadness mixed with shame. He sees her as a lonely woman who cared too much for her clothes but clearly had no money to spend on herself. This book so skillful in its building of suspense and tension not surprisingly proved tempting for scriptwriters. It was adapted and filmed for television twice in Curtiss' lifetime. Once for the 1950s anthology program Climax! with what sounds like a great cast -- Nina Foch as Caroline, Kevin McCarthy as Carmichael and Estelle Winwood as Mrs. Oliver. It was done again in 1968 for the British anthology series Detective about which I know nothing. The Deadly Climate in the words of Anthony Boucher is "a throat-clutcher in the absolute, tightly and economically written." A better summation I could not devise myself. Copies of the book are readily available in both hardcover and paperback (four reprint paperback editions at my count) in the used book market. I'm sure her books will be found in your local library. Curtiss was quite popular in her day and was the kind of writer that librarians loved to keep on their shelves. None of her books, to my knowledge, are currently in print. More's the pity for lovers of excellent crime fiction. More is the pity as she sounds like a good read. Just bought a used copy. Another great prospect and great to hear that it is readily avaiable - off to find this out for myself - thanks chum! I have wanted to read something by this author for a while, ever since I read about her while researching Helen Reilly. 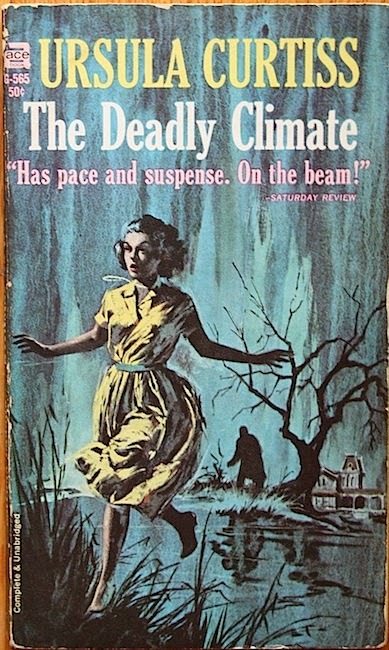 I am not sure I want to read stories with "mounting dread and terror" but I am still going to try some of her books. Great review, John. Gee, that cover of Pocket 1077 is beautifully done. The unusual orientation of the artwork would make it stand out on the shelves, and the silver spine and blue-white colour scheme really make the red type pop out. That Red Badge jacket is also quite attractive. As far as her ability to create suspense, absolutely agree; I just read her "The Second Sickle" not long ago and was definitely impressed by the way she built the tension. Thanks, Polly. My focus is always on the books rather than the writer's life. In the case of Curtiss I read up all about her life and her family but tossed in only a few biographical tidbits in the post above. Are you related? Or is it just a coincidence that the spelling of your last name has the unusual second S? FLASH FICTION: Come Like Shadows, So Depart!